Researchers from the University of British Columbia and McMaster University have developed what could be the bone implant material of the future: an airy, foamlike substance that can be injected into the body and provide scaffolding for the growth of new bone. 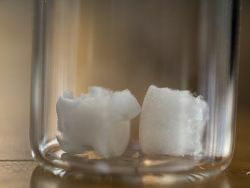 It’s made by treating nanocrystals derived from plant cellulose so that they link up and form a strong but lightweight sponge – technically speaking, an aerogel – that can compress or expand as needed to completely fill out a bone cavity. « These findings show, for the first time in a lab setting, that a cellulose nanocrystal aerogel can support new bone growth, » said study co-author Emily Cranston, a professor of wood science and chemical and biological engineering who holds the President’s Excellence Chair in Forest Bio-products at UBC. She added that the implant should break down into non-toxic components in the body as the bone starts to heal.